Layerco has really made a name for itself in the past several months within the golf industry. After the company's release of the Poly Max Extremes, reviewed here on ZealousGolfer.com, the company has been covered in numerous blogs and even Golf World. However, Layerco happens to have numerous other great products too. 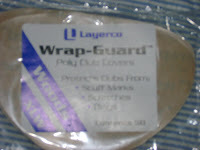 Among these is Layerco's Wrap-Guard Poly Club Covers. As a member of Range Junkies Anonymous, I also happen to have the title of "King of Golf Club Dings". My 7-iron has been hit so many times, there is a crevice a millimeter or two deep near the toe of the club (was fitted this year, so now the impact area is closer to the hosel). Thus, I was intrigued when I found out about Layerco's Wrap-Guard covers as a way to combat the destruction of my clubs' faces. Specifically, I had the opportunity to demo the "Woods XLW" version, which functions as a shield for the faces of larger sized woods. The Poly Club covers are definitely effective as a way to to avoid scuff marks, dings, and scratches. Using a cover is easy, as application is similar to that of the Poly max Extreme: peel and stick. That said, it is just as easy peeling off the cover and simply throwing it away. My only objection is the really the size of the cover. Unless you are hitting a highly oversized driver, or a 460 cc driver with a very tall face, you will likely want to cut the cover down using scissors. Otherwise, the cover will perform fine, but will add some visual noise to the club. Additionally, the cover likely doesn't effect distance, or at least significantly. From my experience, I would be unable to pick out the ball flight of a shot hit with a cover versus a shot hit without. Also, the cover can help to identify swing flaws since the impact position of the ball can be seen relatively easily. The Wrap-Guard is pretty simple: a poly material applied much like a sticker. While the cover can be bought in various colors, I tested and would recommend the clear cover, which makes the club look like any other, so not to catch your eye at a bad time during the swing or attract unwanted attention from fellow practicers. 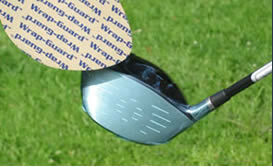 The Wrap-Guard is definitely a helpful product for players who hit balls frequently. However, the size of the Wrap-Guard is a little bit too much. Also, having to buy separate sets of covers for irons and woods can be a little pricey, especially when having to apply 14 covers per session. The product retails at $14.95, and come in packs of 50 covers. 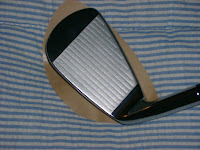 Overall, ZealousGolfer.com gives the Layerco Wrap-Guard 3 out of 5 stars. 0 Response to "ZealousGolfer.com Equipment Review: Layerco Wrap-Guard"